The trailer for the 1931 film “Five Star Final” shows Edward G. Robinson as a guilt-ridden tabloid editor with few scruples… The film itself has a dramatic “reform” ending, but there was never a sequel to explore where the editor and his colleagues went from there. 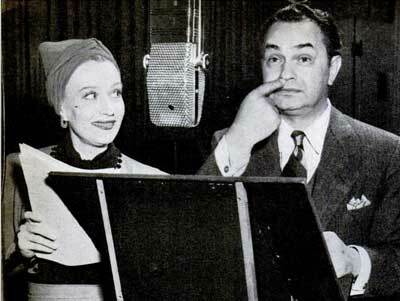 While not billed as such, a long-running radio series actually provided something close to a sequel, and even featured two of “Five Star Final” stars for part of its run..
A recording of the Oct. 19, 1937, radio program is among the series episodes stored at the Old Time Radio Researchers Group Library. To better appreciate the rapid-fire dialogue, you can follow along with the script of “Pittsburgh Lil,” available from Generic Radio Workshop. The story manages to work the Alaska frontier, Ibsen’s “Doll House” and a Beethoven interlude into the plot; you’ll have to listen — or skim the script — to find out how. In this first episode, the Illustrated Press is portrayed as an anything-for-circulation paper, about as bad as the Evening Gazette in “Five Star Final.” That Gazette was inspired by my favorite nutty tabloid of the 1920s, the Evening Graphic. In fact, the film was based on the 1930 play “Five Star Final” by Louis Weitzenkorn, who served briefly as editor of the Graphic before its demise. In both the film and the first episode of “Big Town,” the story starts with the editor dredging up an old scandal to play up for his circulation-mad publisher, ignoring the impact it might have on innocent people. Both scandals concern a woman with “a past.” And toward the end of both stories he faces an angry woman with a gun. “Big Town” starred Robinson — better known for gangster roles like “Little Caesar” — as managing editor, with the 27-year-old Claire Trevor as “Lorelei,” a sophisticated social worker turned society reporter. Her editor is her “reform” target in this first episode. While plenty of later “Big Town” episodes are available online, they portray a more evolved Wilson — as the racket-busting editor of a crime-fighting paper. The transformation from scandal-sheet to civic pillar appears to have happened in the first few months of the series, but only a few episodes of that era are in the online audio collections. In the missing episodes, Wilson apparently wrested the sleazy paper from its controlling owner and set out to change it, change himself, and change the city named “Big Town.” His inspiration came from his muse, Lorelei, and by Pittsburgh Lil, the subject of his scandal-mongering, who tries to kill him in this opening show. Trevor was replaced by Ona Munson in 1940, something of a tabloid reunion. Munson and Robinson had starred together in “Five Star Final,” where he played the guilt-ridden editor and she played Kitty Carmody, a conscience-free sob-sister from Chicago who teams up with creepy reporter Boris Karloff on the sensational story that convinces Robinson’s character to quit the paper. In the film, part of the editor’s impulse to regret his tabloid ways came from his dedicated secretary, not from Munson’s character. Coincidentally, after Munson took over the reporter role on “Big Town,” her Lorelei character evolved into a tougher crime reporter, rather than the society editor presented in the first episode… but she never became the cynical Kitty Carmody. For years only available on Turner Classic Movies and online clips of its trailer, the full-length film Five Star Final is now part of the Warner Archive video collection. For more on the radio show, see my Big Town page.